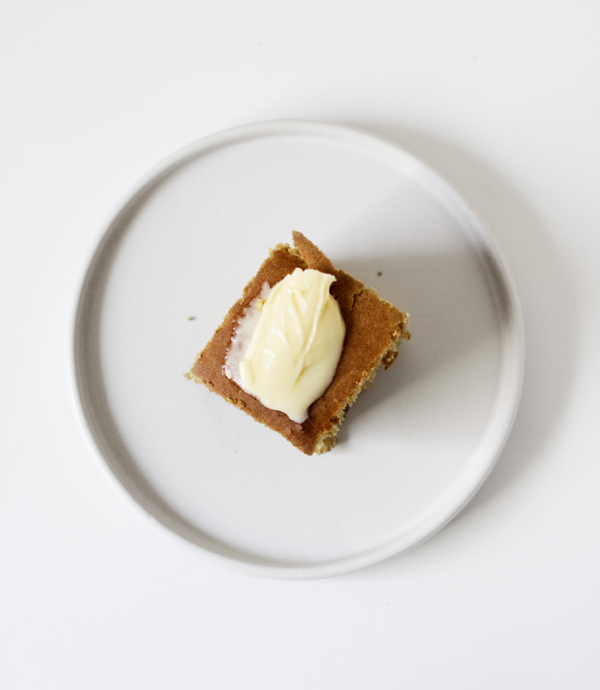 One of my intentions lately has been to post more of my staple recipes–the ones I find myself making at least every couple of weeks, if not more. 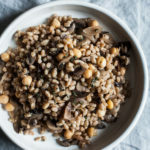 I’ve shared some of these in recent months already, including my go-to cashew cheese and all-purpose cashew cream, my two lentil chili, and my chickpea oat balls, all of which make frequent appearances in my weekly menu plans. As we sit perched on the divide between August and September, I think it’s now high time for cornbread. 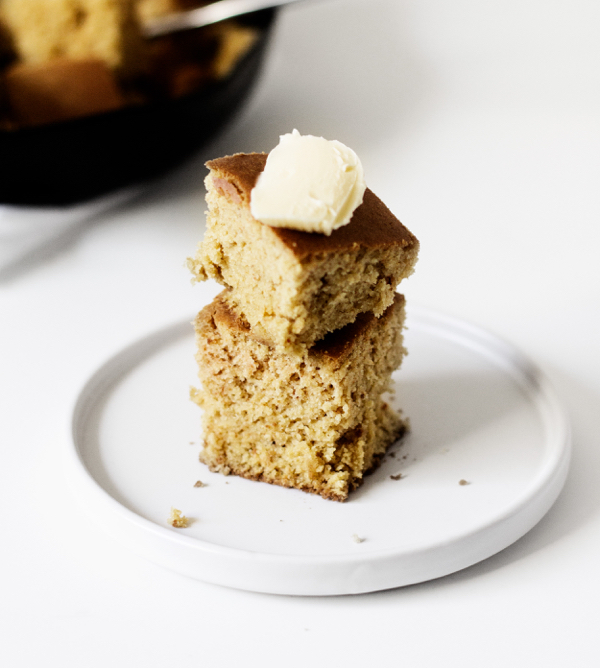 This simple, whole grain vegan cornbread recipe is my go-to, and it’s a perfect accompaniment for any bowl of chili, soup, or stew. Making cornbread has become a cherished ritual at home, for many reasons. First is knowing that I’m making one of Steven’s favorite things; one of the pleasures, I’m learning, of living with someone is that you start to develop as intimate a sense of their food likes and dislikes as your own. Cornbread is at the top of his list, and since I love it, too, it’s an easy side dish for us. I used to worry about making it because I feared that I wouldn’t be able to finish a loaf once I made it, but we polish off leftovers with breakfast, or sometimes I freeze them: either way, it’s all good. I also can’t help but associate cornbread with hearty, healthful, comfort food. I’ve served this cornbread recipe with tofu scramble, with barbecue tempeh kebabs, with stewed beans and collards, and with just about any dish that involves vegan gravy. More often than not, I serve it with a pot of chili, a big bean or lentil stew, or some other kind of soup. You can do a lot of things with cornbread, but it tends to accompany dishes that are soulful and satisfying, and the associations are pleasurable in their own right. 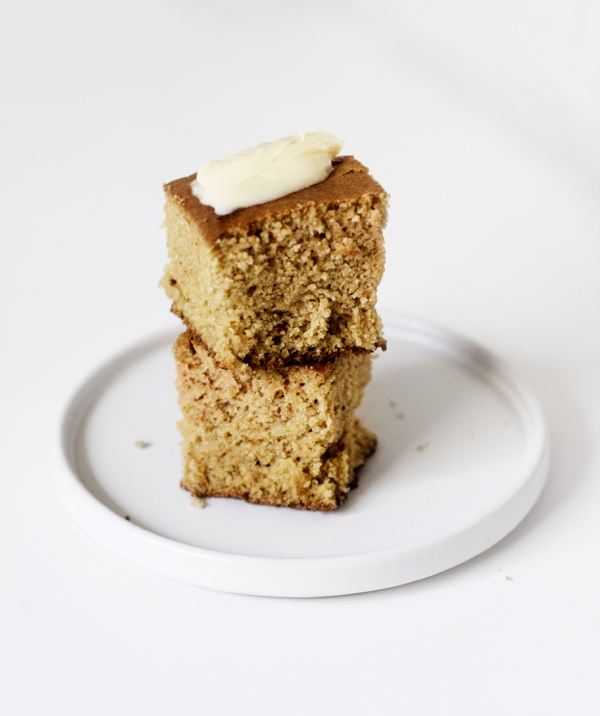 Cornbread isn’t difficult to make vegan, and there are plenty of recipes out there. The one I’m about to share is simply my favorite, the one I return to and modify again and again and again. I love its ease and simplicity, as well as the fact that it stands up nicely to variation. I like to make it with whole grain flour, such as spelt, white spelt, or whole wheat. But as you’ll see, I’ve made the recipe with all-purpose and gluten free all purpose flour, too, with excellent results. I typically choose to use a medium-grind cornmeal, which results in a nice, hearty crumb, but if you’d prefer the cornbread to be a little lighter and more cake-y, you can use corn flour or finely ground cornmeal instead. And finally, there’s the choice of baking vessel. I usually make it in a square baking dish, but there’s no reason not to use a 12″ skillet, if you prefer to. Preheat your oven to 350F and lightly oil a 9 x 9 square baking dish (or a 12" cast-iron skillet). Whisk the apple cider vinegar and non-dairy milk together in a small mixing bowl until the mixture is frothy. Combine the cornmeal, flour, baking soda, and salt together in a large mixing bowl. Add the oil to the non-dairy milk, then pour the wet ingredients into the dry ingredients. Mix until the batter is just evenly combined (a few little clumps are OK). Pour the batter into the baking dish and transfer it to the oven. Bake the cornbread for 35 minutes, or until the top is firm and the edges are gently golden. Allow the bread to cool before cutting it into squares and serving. *In place of spelt flour, you can use all-purpose flour, gluten free all-purpose flour, whole wheat flour, or whole wheat pastry flour. For a sweeter cornbread, you can add 4-6 tablespoons sugar to the dry ingredients. Leftover cornbread should be wrapped individually and stored in a cool, dark place. The individually wrapped pieces can be frozen for up to one month. If you’re serving the cornbread on its own, a pat of Earth Balance or jam is very nice, or simply use it to sop up any goodness from the dish you’ve prepared it with. 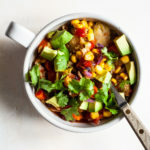 And if you want to get creative, you can try stirring in corn kernels, chopped jalapeno or poblano peppers, or a some nutritional yeast for a cheesy flavor. So there you have it: one of the recipes I love most, finally put down on the page. Perhaps you’ll love it, too, and come to rely on it as much as I do. I hope you do. For what it’s worth, making a batch this week compelled me to actually give some thought to cornbread pairings that aren’t in my usual repertoire of soup, stew, chili, and so on. And the recipe that emerged is fresh, summery, and really delightful. Can’t wait to share it with you in a day or two! Who doesn’t love cornbread? I also associate it with hearty comfort food. something about it brings back cozy memories. Oh YAY! As a Southern girl who is back living in the South (and now vegan) I’m so happy to have this recipe. And once again, I love it that your ingredients are ones that typically live in my pantry. I have one cast iron skillet (10″, but that should work well) that is going to be the only baking dish I use. (very limited kitchen space) Hey, this would be yummy with your tomato jam. Hmmm? Oh gosh, it would be *so* yummy with the tomato jam! Great idea — and I still have a few slices left to try it with. Mmmm….on this dreary rainy day, this looks like the perfect comfort food. And so flexible – perfect! Most cornbread recipes call for baking powder, but yours calls for baking soda. Is that a typo? It isn’t a typo — but I might have wondered the same! Is it possible to substitute the oil for just water? Like does it act as a binder or is it just there for flavor? I used three ounces of applesauce (just blended up apple, peel and all, in Vitamix). It worked super well and it was delicious! Thanks Gena! Hello, love your site. Made your cauliflower and corn chowder with the cornbread, amazing! Could I substitute the flours for rice flour or oat flour instead of gluten free all purpose? I have best results with GF baking when I use a flour and starch blend—usually just rice or oat flour ends up gummy for me. If you’ve had great success with either flour on its own, feel free to try it! Thanks, I used chickpea flour and it was good! I made this and the texture was great. However, it didn’t have much taste. I added 4 tbsp of coconut sugar. I prefer savory over sweet so maybe corn kernels would have been more to my liking. I made it with veggie chili but I also like to eat it on its own.